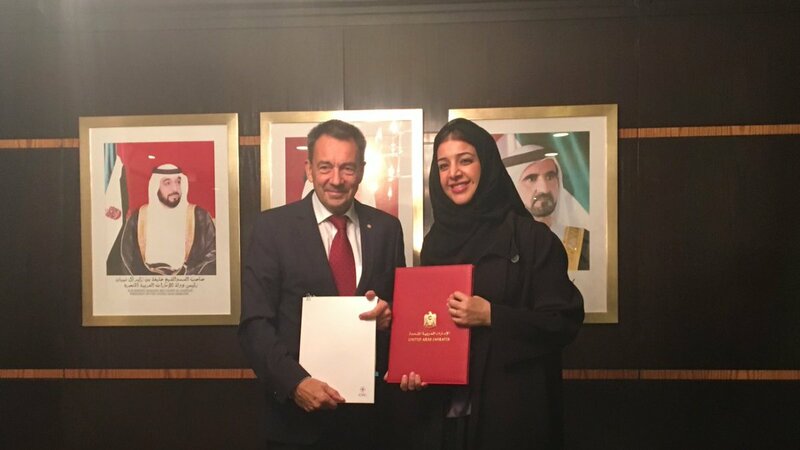 NEW YORK, 24th September, 2018 (WAM) -- The UAE Ministry of Foreign Affairs and International Cooperation has signed a cooperation agreement with the International Committee of the Red Cross, ICRC, to support the humanitarian response plan in Yemen, Myanmar and the Democratic Republic of Congo, in addition to support ICRC’s budget, totaling AED40.4 million (US$11 million). The agreement was signed by Reem bint Ibrahim Al Hashemy, Minister of State for International Cooperation, and Peter Maurer, President of the ICRC, on the sidelines of the 73rd Ordinary Session of the United National General Assembly in New York. Under the agreement, the UAE will provide the ICRC with US$6 million to support health centres, water and sanitation facilities in Yemen, US$1 million to support the Organisation's humanitarian efforts in Myanmar, US$1 million to support humanitarian efforts in DRC, in addition to US$3 million to support general programmes. Reem Al Hashemy said that the signature of this agreement reflects the UAE’s efforts to achieve peace and prosperity in the world through its foreign aid policy and its humanitarian and development projects, in accordance with the vision of the wise leadership of the UAE. She stated that the purpose of this grant is to support the humanitarian efforts undertaken by the UAE in many countries around the world, within the framework of the humanitarian and development approach of the UAE, and to stand by social groups in need. She stressed the UAE’s will in pursuing fruitful work with the ICRC, to contribute in the alleviation of human suffering and support those affected around the world to overcome their difficult humanitarian situation. For his part, ICRC President said, "The ICRC welcomes the UAE’s financial contribution to its humanitarian activities. We are thankful for MoFAIC’s continuous support to the ICRC’s mission in contexts of emergencies and protracted crises." The agreement signed with the ICRC included support to health centres, water and rehabilitation of sanitation structures in Yemen, and meeting basic needs of those affected. The agreement also stressed the importance of receiving the wounded and the sick for appropriate medical treatment, as well as assisting disabled persons through the provision of physical rehabilitation services. With regard to the agreements signed with the aim of supporting health centres, water and rehabilitation of sanitation structures in Myanmar and DRC, they included the provision of humanitarian assistance to those affected by armed conflict, assistance in accessing basic services and relief, and timely medical assistance to the sick or wounded from armed conflicts or others situations of violence. The UAE is a member of the donor support group of the ICRC.